This will be great for the public pool. I live in a beach resort town, Sarasota, FL. 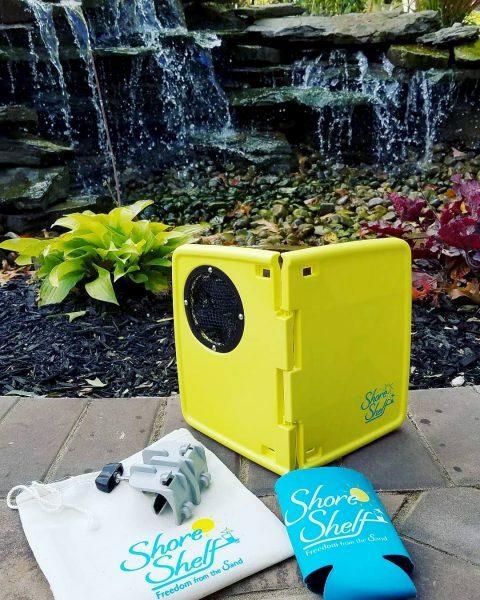 This Shore Shelf pack would go with me as I visit the beach a lot. My backyard area around the pool! I would love to win this great stuff, will go great with my visits to the lake this summer! I would use them when I visit the beach. I’d use it when I go to the beach in Grand Cayman. Heading to the beach. This will be perfect! I would use on our next beach trip. Might take them to Kings Island amusement park. We will use at our first spring sports event. I own a weekend lake house in Virginia and would use this as I sit and sip wine on my little dock. Really would like to give it a try. I will use it for the first beach day of the summer! Back patio by the pool! I would take it to our local beach! This would be handy everywhere. My little weirdos like to hang out in giant boxes and this could even be used in those. Actually I probably will use it first on our pool deck all summer long! Then I’ll definitely take it with us when we stay at the beach for a week towards the end of the summer! I would take this to the pool. It woild save me from ants. I will use at my apartment’s pool and take it with me when I go to the beach. I would use it by the pool while we are swimming.